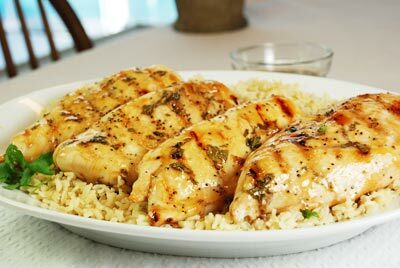 Prepared using 4 ounce chicken breasts. Mix teriyaki sauce, apple jelly and ginger in 1- quart saucepan. Heat to boiling, stirring constantly, until jelly is melted. Spoon half of the mixture into a small bowl; stir in cilantro. Set aside to serve with chicken. Season chicken with pepper. Place chicken on preheated grill and cook for 15 to 20 minutes, turning and brushing with glaze mixture during last 10 minutes of grilling. Serve with reserved glaze mixture.